I wrote about treasures in today's post. One treasure I would love to find is an early edition of the book I featured in the post. Everytime I'm at a bookstore, garage sale, flea market, I look for the book. 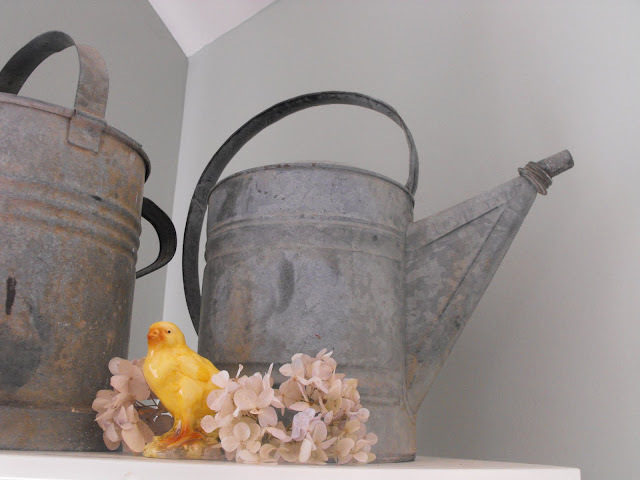 Love those old galvanized watering cans. We have one around here someplace and still use it. Oh, I love it! Galvanized anything is loverly. I posted on my blog about my trip to the Metz, France flea market last week if you're interested. Soooo many pretties. 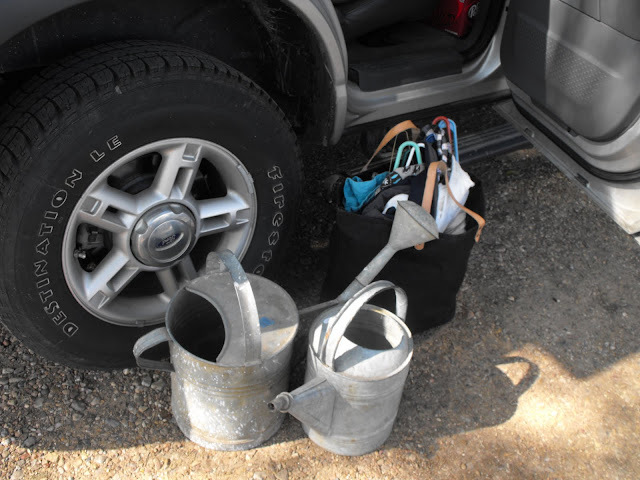 Your old watering cans are awesome, Susie..Love them.. I can't find your shop!!?? Love them ~ I'll have to keep my eyes open when we go to Brimfield this spring. 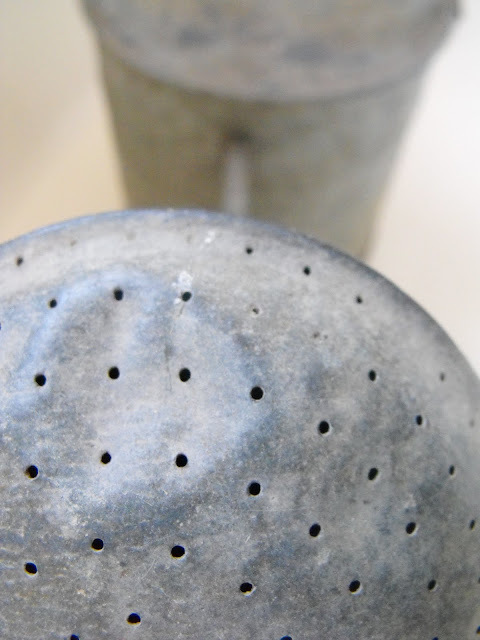 I love old watering cans too. I have different sizes that I have collected. (I believe I still have one left on my website Maisonstgermain.com under garden.) I have them in my solarium with my plants and other garden collectibles. Where do you keep yours? I need some more mailboxes, the kind you hang on the house next to the door. Love your water buckets. I have left things behind many times that I wish I would have gotten or gotten more of. I went to the endless yardsales this year and bought a few old feed sacks. Boy, I wish I would have bought a whole lot more. Still on the lookout for them and hoping to find them as cheap as they were then. I love these, I collect large tubs and use them as planters in my yard, I have never thought of using them inside. I will have to try that, thanks for the inspiration. I hope you are still enjoying your book, I keep going over and over it. Some it cuts pretty deep. Hmm... do I have a special treasure I am hunting for?? My dad and I have a saying... we will know it when we see it! :) We are always treasure huntin'!! Hey girl! You should come for a visit to my house. I have lots and lots of galvanized goodness at my house! In the form of chicken waterers and feeders, buckets and of course water buckets...I too love them. And I like that you enjoy the dented ones! hahaha...they are much like people...the dents represent a little more...interest! Oh!! Goodness indeed! I love how unique they both are. I am so looking forward to warm weather so that I can venture out to random flea markets to find treasures. Galvanized...such a GLORIOUS term!! Love it...and these pictures are making me CRAVE warm weather and the hunt for delightful treasures. I'm also looking for wire baskets to store my quilts in. someday I will find all my goodies but you're right, it's the thrill of the hunt! First, I've got to know...what's/where's Roundtop??? I'm always on the look out for antique linens, laces and doilies! Click here to see my new give-away! Hey Susie! How have you been? looks like summer at your house! I passed one of these beauties up at a thrift store recently and am still smacking myself upside the head. These look like they need a bouquet of hydrangeas in them! So cute. What's roundtop? Aren't galvanized cans awesome? The one that sits near my front door is always full when the weather is warm. Not just for impromptu watering but because both my dog and cat like to stop by for a quick drink. I think they like how the metal keeps the water cool. I love how you put things together-You always make everything look so great! I love the watering cans!!! Hugs! "They have a sense of history being told through layers of glorious patina." I love that sentence! I love old windows, church windows in particular. That's the collection I have in my imagination. It would be fun to make it come true. I love those watering cans. I have along list of treasures that I am currently hunting for~vintage cookbooks, old windows, vintage cake stand, cloches, and I would love to find some vintage metal gates. I have a project in mind. Hi Susie, what a fabulous blog you have, love it. I found you through Jenn's blog and so happy! HI Dear Susieness! 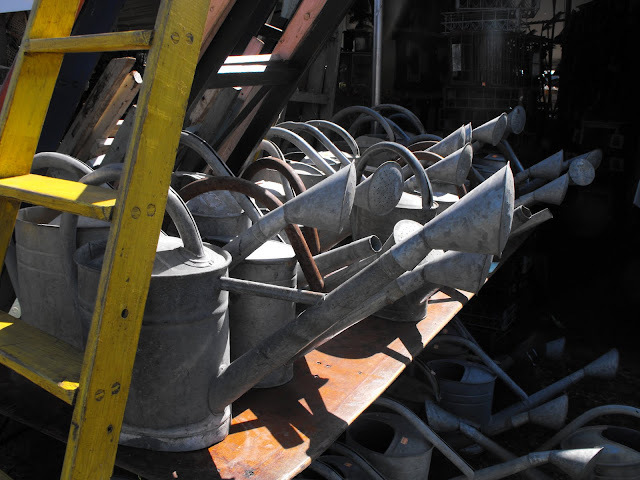 Oh, what great old galvanized watering cans! I like the look of them too. Now I'll have to be on the outlook for at least one. Now I have a confession to make - I came to see you yesterday and decided to go to your very first post. I did and just had the best time reading your posts from the beginning! I hope you don't mind. You're just the most darling one! I was just browsing on shopgoodwill.com and they have an antique galvanized kerosene can listed for $5! I love shopping for small antique childs chairs...we have three small children and LOTS of little chairs in our home, I think they're so sweet. Funny thing is, they all get used. Love them! I actually found a GORGEOUS one today. You would love it! My treasure is white ironstone pitchers. Ooo I love to find them. I love these!!! Reminds me that I need to bust out my spring decorations. 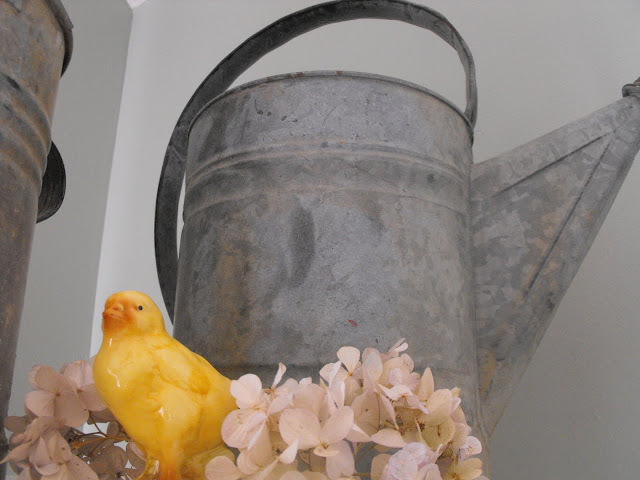 There's nothing quite like an old watering can...I lov'em too. I love old watering cans! I have a huge one I got on Nantucket & can't wait to put it out with my "Spring-y" things soon! I actually need to pare down & sell some of my collections of junk goodies, but I still am on the lookout for unusual vintage floral frogs for a collection I have. i need a few more myself! 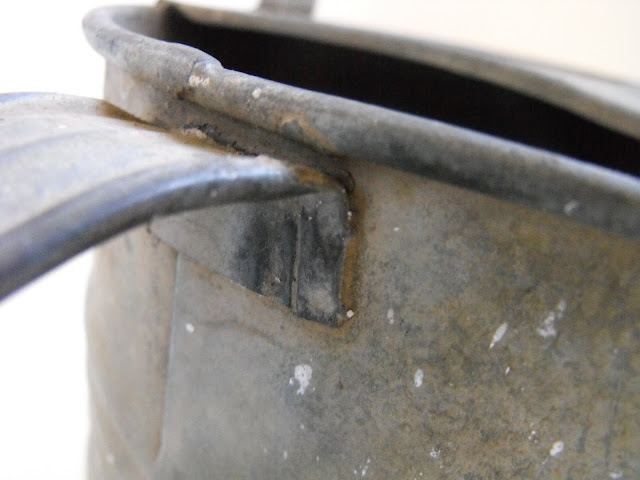 I've been looking for a crusty old watering can! I love the ones that have been painted and are chipping too:) It's almost time for gardens and spring and fun!!! !